Below is an YouTube Video of my advanced settling filter system. At the time of writing it's been running nicely for twelve months and produced around 1,500 litres of clean oil using only ONE single 1 micron sock in all that time. For some the Video might be enough for them to grasp instantly the concept - especially if they've been designing their own set ups over the years. However for some a little more clarification may be required. Whilst filtering takes place throughout this system the majority of filtering takes place in the Conical Tank. So let's take a more detailed look at how this system works. The Conical Tank might not be the first component of the system but in many ways it's the most important. It contains - at all times - 120 litres of WVO (purely because that's capacity of the barrel). This concept may seem a little strange at first but it is critical to the whole process, so let me say it again - at all times there is 120 litres of WVO in this tank. That means when you first create this system, you must sacrifice 120 litres of clean oil to the process. In other words, if you have 200 litres sitting around, at best you'll get 80 litres out the other end. Now don't panic. This is a one-off thing. Essentially you are priming the Conical Tank. The next time you pour, say, 170 litres into the system, you'll get 170 litres out, but initially you must realise that this sacrifice is necessary. The content size of the Conical Tank is finite. It is defined by the placement of the inlet and the outlet. This may sound confusing but all it means is this - it holds around 120 litres. If you pour more in, in the same way a bath overflows, so the Conical Tank overflows until there's only 120 litres remaining. The Conical Tank holds a large volume of oil. It sits very still and allows settling to take place. Nice clean oil rises to the top of the tank and dirty oil, fats and water fall to the bottom, settling within the "cone" of the tank for easy drainage later on. After just a few days of sitting quietly, this oil is virtually clean. The problem is, of course, getting this clean oil out without agitating it and disturbing the nicely settled content. This is achieved, believe it or not, by introducing dirty oil, and we do that using the Header Tank. The Header Tank is quite small, holding around 20 to 30 litres. This is where WVO is introduced into the system. WVO is poured through a 100 micron sieve into the tank where it SLOWLY seeps away into the inlet situated at the bottom of the Conical Tank. In essence the dirty oil introduced into the system within the Header Tank pushes its way into the Conical Tank. SLOWLY (over the period of at least an hour) it displaces the exact volume of oil that was placed into the Header Tank from the Conical Tank. In other words if you pour 5 litres into the Header Tank then 5 litres will be displaced from the Conical Tank. The Conical Tank carries a balanced, finite amount of settled oil, in this case 120 litres. By SLOWLY introducing oil into the bottom of the Conical Tank (from the Header) we cause the Conical Tank to overflow into the next tank - the Filter Tank. It overflows from the top of the Conical Tank, where the oil is cleanest. So we've used the movement of the dirty oil to push out clean oil - we've filtered our WVO. You'll notice the emphasis placed on the word SLOWLY . There's good reason behind this. The content of the Conical Tank has settled. We don't want to disturb the oil within. So when we introduce the WVO we do so as slowly as possible so as to minimise the agitation that takes place inside the tank. Furthermore we introduce the oil to the bottom of the Conical Tank, not to the top. It's important to take careful note of the position of the Conical Tank's inlet. If you introduced dirty oil into the top of the tank, this would mix with the clean oil that's floating near the surface, ruining all the settlement that's taken place. But if dirty oil is introduced to the bottom, this will push the clean oil up and out of the Conical Tank. The introduced oil will then, over time, settle into the tank and separate again as settling takes place once more. The Filter Tank holds the first of our physical filter media, in this case a 1 Micron Filter Sock. You'll notice there's been no other filtering stages - no stepping from filter to filter to filter. The WVO was introduced to the header tank though a 100 micron sieve, but that's it. There's been no filtering because it's not needed. The settling process that took place in the Conical Tank has done all the work. Personally I have found by this point that the oil passes straight through the one micron filter. The sock remains so clean that, for me at least, I only replaced it after one year of use (and around 1500 litres of oil). But I believe in being thorough so even though the sock is practically superfluous, use it! 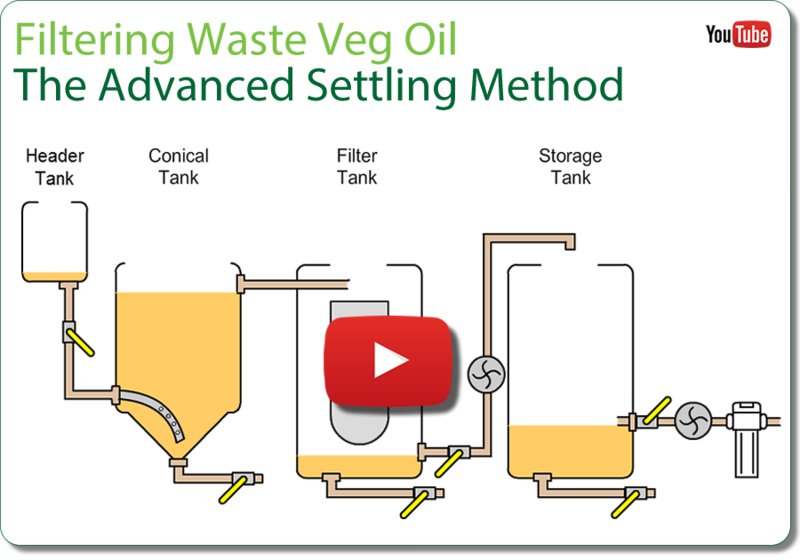 Filtered oil then sits within the filter tank until it is transferred to the Storage Tank. The Storage Tank is the final resting place of the cleaned WVO before its put to its end use. Personally I work in batches and, over a week I'll feed 80 litres or so into the system and therefore have 80 litres to place in more Storage Tank at the end of the weekend. I then let this sit and, you've guessed it, settle some more. It really doesn't need to, it's already been settled and passed through a 1 Micron Sock, but again it's another of my safety checks. More settling certainly can't hurt anything and should any dirt, fats or water manage to get into my Storage Tank, they'll settle harmlessly to the bottom of the tank. As with the previous tank, the outlet is not at the bottom of the tank but a few inches up. When I'm ready to draw out my cleaned oil, usually in my case after two to three weeks, I can be confident that the oil within is as clean as I can get it - but that doesn't stop me from performing one final filtration... A lever valve seals the outlet, so when this is opened the oil passes into a Drill Pump. From there the oil is steadily pumped into an in-line filtration unit that holds a 1 Micron Filter Element. We don't want to pump it through too quickly as this will FORCE the oil through the filter which circumvents the filter medium by forcing open the pores. Steady and moderate pressure from the pump allows the oil to pass through the filter medium and thus clean it for a second time to 1 Micron. From here the oil is ready to use, free of fats and water. So, a recap of the above... There's 120 litres in the Conical Tank. We poured say 5 litres into the Header Tank which seeped into the Conical Tank where it displaces 5 litres of oil. The Header Tank is now empty. The Conical Tank still holds 120 litres of oil and 5 litres of nicely settled clean oil has passed into Filter Tank, through a 1 Micron Filter Sock. Then this oil is then moved to the Storage Tank where it sits a few weeks, settling, before finally being pumped out of the Storage Tank, through a 1 Micron In-Line Filter, whereafter it's ready for use. The above setup works brilliantly. I can highly recommend it. Obviously there's higher costs involved in this level of setup, and more space is required for tanks, but that's not too much of a sacrifice. After twelve months my filter sock clogged up. I replaced it but a month later it clogged again. Strange, I thought, the other lasted ages. But then it occurred to me after all this time the Conical tank was finally full of dirty oil. Obviously there's a clean-out valve at the bottom of the conical tank, and I had made regular use of this, drawing out the thicker looking content. But over time the content became thicker and thicker. It passes easily through a 50 micron filter, but it clogs a 1 micron sock. Thus, at the end of twelve months trouble-free use, I needed to empty the Conical tank, clean it, and prime it once again with good clean oil. Of course I couldn't leave it there. I had another idea in mind... my Multi Settling Tank method. Oh wow... it's good.